"About 3.45 pm (summer time) word was passed that enemy cruisers were insight, and it was generally believed at first that a portion of the enemy light forces had been caught napping whilst out on a raiding expedition. Action stations were sounded, and hardly had everyone settled at their post - my particular station was the port turbine room - when word was passed that enemy battle cruisers were in sight. This was promptly confirmed by the firing of our big guns, and by the thuds and crashes of heavy projectiles, which told us we were under fire of considerable calibre. Previous experience enabled even those of us cooped up between decks to judge fairly accurately, not only which of our own guns were firing, but also the general location of the enemy hits on us. Very early in the action an incident occurred which came very near terminating the career of the Tiger. A heavy thud, followed by a deafening report immediately overhead, intimated that a heavy shell had penetrated the side armour and had burst inboard. The base of the shell, forced out intact by the explosion, penetrated the upper deck and the armoured deck, and punched a neat hole in the steel bracket supporting the main steam pipe on the forward bulkhead of the port engine-room, and remained balanced overhead. Had the base of the projectile struck the pipe instead of the bracket, the whole engine room staff would have been wiped out, and the ship completely disabled until the steam to the damaged piping was shut off, an operation which would probably have involved the vessel being destroyed by concentrated enemy first as she drifted helplessly out of the line. The immediate consequences, however, were quite serious enough. 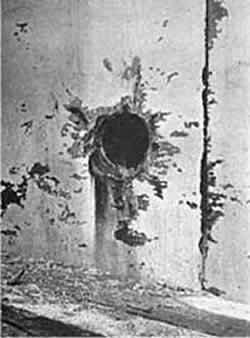 The shell bursting in the ammunition passage killed a dozen men, set fire to the ready-to-use cordite in the passage, rendering it necessary to flood the midships 6-inch magazine, cut through the fresh and salt water mains, and finally the base of the shell, which in penetrating to the engine-room, had severed the H.P. air pressure ring main, giving the impression by the hiss of escaping air that the steam pipe itself was damaged. No examination could be made to locate the trouble, as through the hole in the deck were pouring the fumes from the burning cordite, and the engine-room was immediately filled with dense smoke which rendered it impossible to see. Gauges, telegraphs, etc., could only be examined by the aid of flash lights and electric torches at intervals. To add to the difficulties, water from the severed mains poured through the damaged deck overhead, over the separators, and over the main steam pipes on to the platform, so that the men stationed there were subjected as the ship rolled, to alternate cascades of cold and semi-boiling water. Attempts were made to proceed to the scene of the explosions from the forward end of the engine-room but it was found that the forward escape was blocked by wreckage. Access was finally obtained through the escape at the after end of the engine-room, and the depleted repair party, many of whom had been killed or put out of action by the explosion and fumes, set to work to plug the damaged piping in the passages. In the engine-rooms matters gradually improved. As the cordite burnt out the smoke clouds became less dense, and matters assumed a more normal aspect. 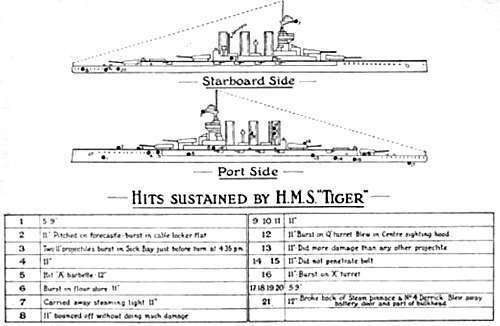 The roar of heavy guns continued steadily the while, informing all that, whatever the general state of affairs were in the fleet, the Tiger was keeping her end up, while the frequent bursts of firing from our 6-inch secondary armament indicated the approach of enemy destroyers or light craft. From time to time messages of varying import reached us from the upper deck. The loss of the Queen Mary was marked by the filling of engine -rooms with dense clouds of smoke, as the Tiger steamed through the area where she had been, and occasional lulls enabled hurried expeditions to be made to the scene of serious damage for essential repairs fo be organised and arranged for. Men in isolated posts were visited and occasional exchanges of posts arranged. Eventually the firing gradually died way and towards 11pm word was passed that the immediate action was ended, but that action stations would be resumed at dawn, or earlier. The interval was spent in frenzied work on repairs, and some of the scenes between decks in the vicinity of shell bursts beggar description. But the most marked feature of the action that came under my personal observation was the coolness and discipline of the engine-room and artisan staff generally, under the most trying conditions, and their initiative and readiness of resource in effecting apparently impossible repairs in emergencies."